Tasting World Cup glory for the second time of his career, Fan Zhendong ensured it was he whose dreams came true at the end of a magical three days in Disneyland Paris. This is a career that, on the evidence of the weekend, seemingly knows no limits. Entering the tournament ranked World Number One, the 21-year-old’s star has risen even further with this victory. If truth be told, Fan Zhendong’s credentials for the World Cup crown never looked in doubt, only losing two sets throughout the tournament, once to Chinese compatriot Lin Gaoyuan in the semi-final and once to finalist Timo Boll, resulting in a 4-1 scoreline (11-9, 11-5, 11-6, 9-11, 11-8) on Sunday afternoon. A special word ought to go to 37-year-old Boll, who – 13 years since his last World Cup victory – carried both German and European hopes with grace and an exemplary sportsmanship that shone throughout all 35 matches played. While Boll claimed a second World Cup silver medal in as many years, Lin Gaoyuan took the bronze with an impressive 4-1 victory (11-7, 11-9, 9-11, 11-4, 11-3) over Dimitrij Ovtcharov. Lin Gaoyuan had led Fan Zhendong in his semi-final this morning, but the #1 seed soon took control of the match, running out with a 4-1 win (10-12, 12-10, 15-13, 11-7, 11-6). In a rematch of last year’s final, 2017 champion Ovtcharov lost 4-2 (14-12, 7-11, 13-15, 11-9, 11-13, 5-11) to compatriot and longstanding team-mate Boll. 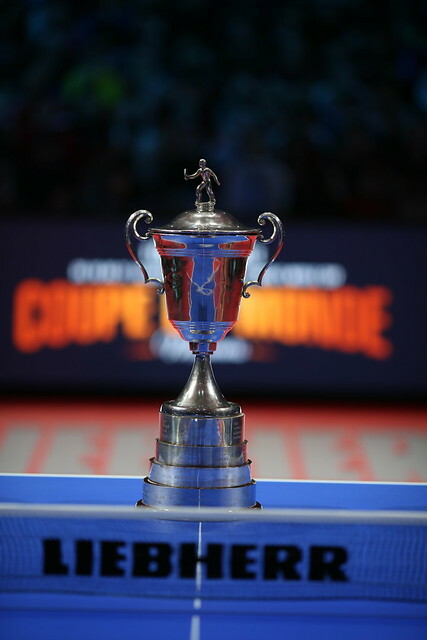 With the 4,000-seater Disney Event Arena full from start to finish and tens of millions of viewing on TV and digital platforms, the Liebherr 2018 ITTF Men’s World Cup was a roaring success for a sport that continues to enjoy a rapid, global growth. If Day One was remarkable for the number of scintillating fightbacks – both Simon Gauzy and Emmanuel Lebesson wowed fans worldwide by returning from 3-0 and 3-1 down respectively to clinch dramatic victories – the entertainment was more than maintained heading into the weekend. Following Jonathan Groth’s win over Mattias Falck across seven games the eve before, Saturday saw three more matches last the maximum duration and all involved Dimitrij Ovtcharov and Lee Sangsu. The German kept his cool first to defeat Falck in the round of 16 and then utimately see off the feisty Korean, who had shown a real resilience to beat home favourite Gauzy earlier and simultaneously end French hopes of glory. Then, of course, for the final day drama, pitting two sets of compatriots, team-mates and friends against one another, as Boll and Zhendong ultimately booked their place in the showpiece event, not without Ovtcharov and Gaoyuan putting up a serious fight. Following a successful Men’s World Cup in France, table tennis fans can now look forward to two Seamaster World Tour events over the next fortnight: the Swedish Open to be held Stockholm between 1-4 November and the Austrian Open to be held in Linz between 8-11 November (a Platinum event), as players work towards the World Tour Grand Finals in Incheon, Korean Republic between 13-16 December.